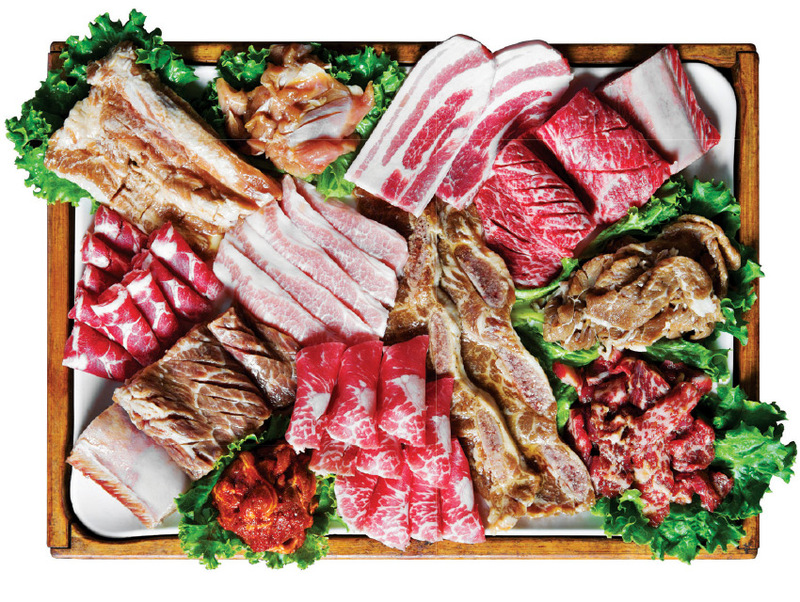 The art of grilling succulent slabs of meat has been integral to Korean cuisine for centuries, but the tabletop barbecue method seen around K-Town was popularized in postwar South Korea when once-scarce animal protein became available again. The all-you-can-eat (AYCE) style offered these days can mean an overwhelming number of options and unfamiliar cuts, and the best way to prepare each item may be unclear. Here are half a dozen ways to enjoy the abundance over an open flame. Start with unseasoned premium cuts. » Before torching your palate with spicy marinated offerings, kick off the meal with the clean, subtle flavors of unadorned high-quality pieces. Certain cuts of sliced beef (like chadol baegi ) cook quickly; throw those on the fire first, then sip a Hite beer. Graduate to the thicker pieces. » You’ve taken the edge off your hunger and can handle the lag time while juicier hunks of meat—beef tenderloin, pork belly—are done to a turn. Grill the beef for about five minutes to achieve medium rare; you’ll want the pork belly well done. Make haste with the paste. 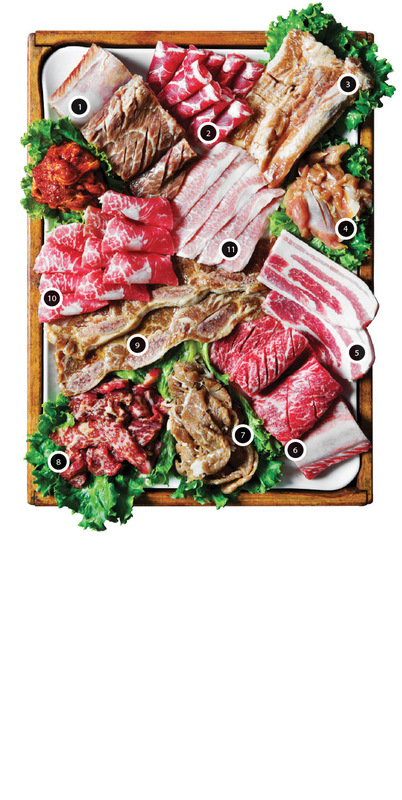 » Chili paste (gochujang) goes well with pork; fermented soybean paste (dwenjang) enhances beef. After the meat is cooked, dip it into the condiments and wrap in a lettuce leaf or rice paper. » The main attraction here is chicken, pork, and beef parts that have been bathing in sauce for hours. Don’t overlook the mokssal, or neck meat: Though it may not sound appetizing, this part of the pig or cow is marbled and rich but not too fatty. » The sign of a well-run restaurant is how many times the servers offer to replace the table’s sticky grate—the more often, the better. Ask them to change it when the surface begins to look charred or before moving on to seewo (shrimp), nakji (adult octopus), and other seafood. Save the rice for last. » A humble bowl of sticky white starch is a potential flavor bomb: Some kitchens stir-fry the grains with savory scrapings from the grill pan. Skip dessert to leave room for serious cocktails.